Group theoretic problems have propelled scientific achievements across a wide range of fields, including mathematics, physics, chemistry, and the life sciences. Many cryptographic constructions exploit the computational hardness of group theoretical problems, and the area is viewed as a potential source of quantum-resilient cryptographic primitives for the future. Group Theoretic Cryptography supplies an ideal introduction to cryptography for those who are interested in group theory and want to learn about the possible interplays between the two fields. Assuming an undergraduate-level understanding of linear algebra and discrete mathematics, it details the specifics of using non-Abelian groups in the field of cryptography. Moreover, the book evidences how group theoretic techniques help us gain new insight into well known, seemingly unrelated, cryptographic constructions, such as DES. 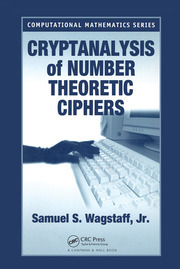 The book starts with brief overviews of the fundamentals of group theory, complexity theory, and cryptography. Part two is devoted to public-key encryption, including provable security guarantees, public-key encryption in the standard model, and public-key encryption using infinite groups. The third part of the book covers secret-key encryption. It examines block ciphers, like the Advanced Encryption Standard, and cryptographic hash functions and message authentication codes. The last part delves into a number of cryptographic applications which are nowadays as relevant as encryption—identification protocols, key establishment, and signature schemes are covered. 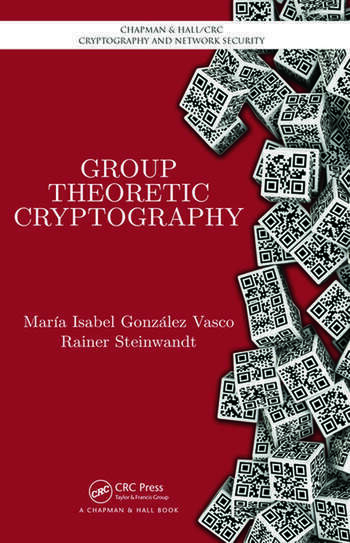 The book supplies formal security analyses and highlights potential vulnerabilities for cryptographic constructions involving group theory. Summaries and references for further reading, as well as exercises, are included at the end of each chapter. Selected solutions for exercises are provided in the back of the book. One-way functions from non-Abelian groups? Using a group that is not finitely presentable? "Group Theoretic Cryptography is highly welcome. It provides an excellent introduction in group-based cryptography where algebraic properties of the platform groups, mainly from combinatorial group theory, are used prominently in both devising cryptosystems and in cryptanalysis. In particular the difficulty, in a complexity sense, of certain algorithmic problems in finitely presented groups has been crucial in encryption and decryption. ... I highly recommend the book under review. It is of great value for researchers in the area as well as for advanced students which start to work in cryptology. The excellent figures and algorithmic descriptions are clear and good to understand. They help the readers to see the important points.